The fabric bears a pretty floral posy design on a cheerful blue background. 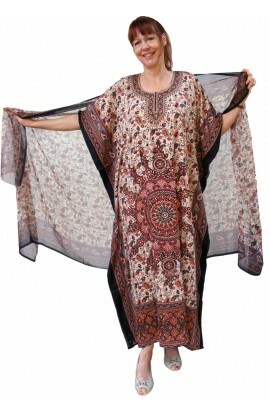 A kaftan in good quality crepe-feel polyester. Free flowing machine washable, minimum iron fabric. 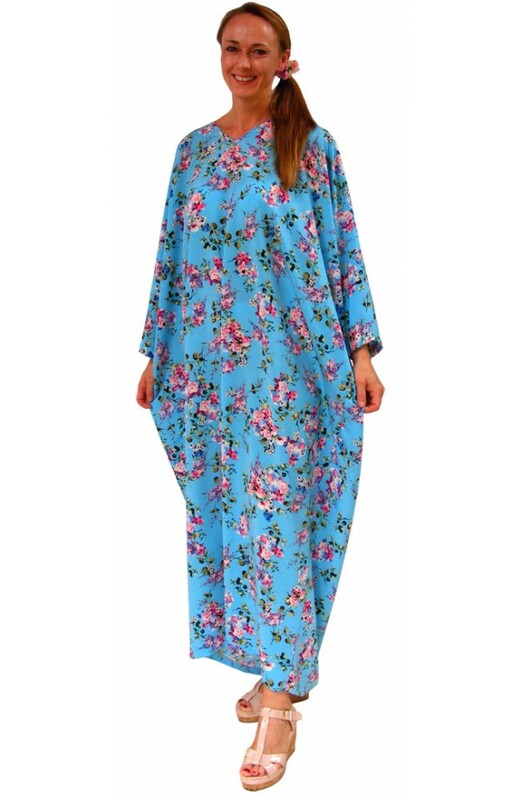 The “standard” size of this comfortable kaftan is free-sized and will loosely fit any UK dress size from 14 to 28. The standard shape is tapered – meaning that it tapers inwards as it travels downwards towards the bottom hem. For sizes larger than above, or for people who prefer more room, this is also available with “straight” sides. Also, for customers who prefer a smaller version, this is also available as a trimmed in version – at no extra cost. SPECIAL BESPOKE LENGTH is also available.